After weeks of apparent deliberation over the name and months of screenshots, Microsoft has just taken the wraps off Windows 10, and below, we’ve all the key details as revealed by the software company. 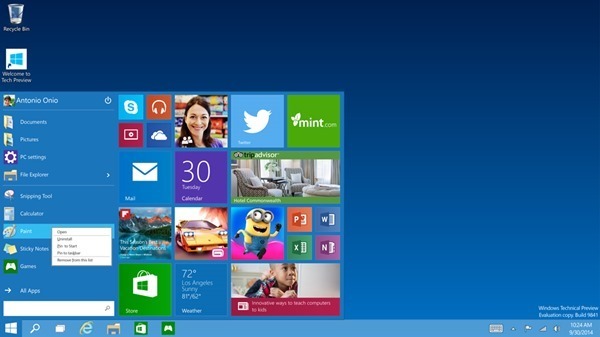 Given that the two versions preceding Windows 10 were Windows 7 and Windows 8 – Windows 8.1 scarcely constitutes a major release, it was strongly suspected that the build codenamed Threshold would evolve into Windows 9. However, with suggestions floating around including “Windows X” and “Windows One,” the software maker has settled on Windows 10. 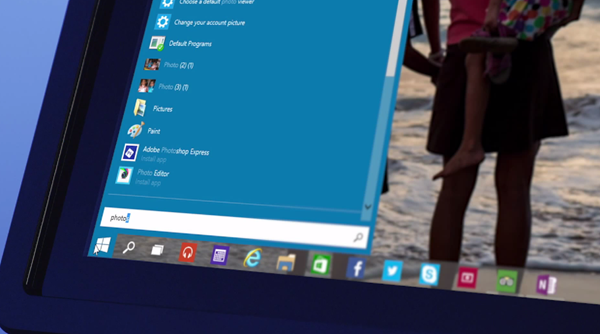 But aside from the name, what does Windows 10 include in terms of features? Here, we dissect the announcement, and check out what’s in store. With Windows 10 and beyond, Microsoft will allow consumers to source content for all devices running its software from one central point. No longer will there be a different store for Xbox, Windows Phone and Windows, but looking ahead, apps, music, video and other such effects will be plucked from the same portal. It mixes elements of old and new, animating like it did on Windows 7 but sporting remnants of that Metro / Modern interface, and not only does this seem like a happy median, but Start menu tiles can also be resized. 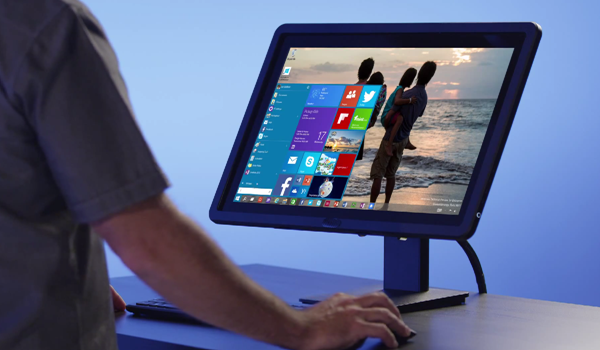 If you boast a two-in-one PC then you’ll be presented with a brand new Start Screen. And under-the-hood, Windows 10 will detect which sort of hardware you’re running and it will adjust the user-interface to fit your needs. 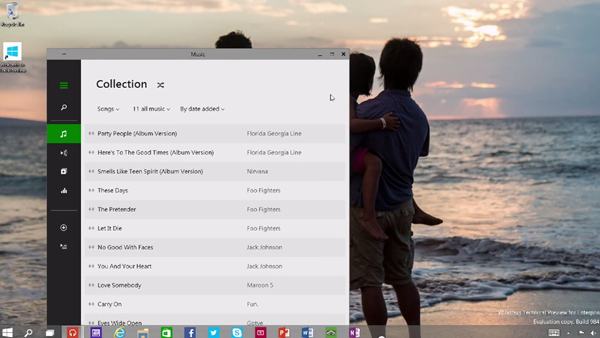 Continuing on the topic of the Start menu, search has also been enhanced with Windows 10. Users will be able to key in their search queries directly from Start, and can perform both local and Web searches using this particular facility. Microsoft was panned by critics for going on head-first with its big Metro / Modern ideas for Windows 8 without considering that the vast majority of its user base used – and still do use – traditional rigs bereft of the touch-screen. 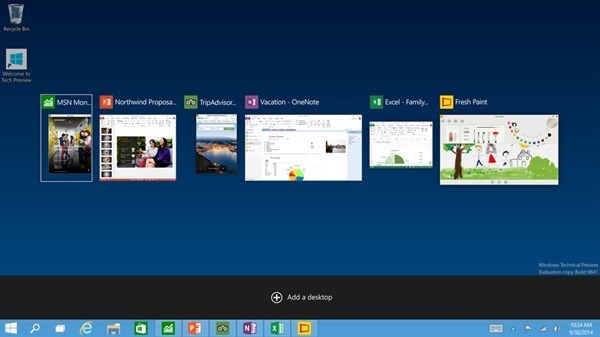 The new ‘Task View’ button, for example, which is located on the task bar, throws up an Exposé-like view of all of your apps, and even though Windows 10 is still very much in development, productive users will certainly enjoy some of the tweaks that have been made here. The all-new Snap Assist UI allows “up to four apps to be snapped on the same screen,” as per Microsoft’s official press release, and with a neat, smart suggestions feature that’ll indicate which open apps you should fill up empty desk space with, it’s a very intuitive all-round feature. Windows users have long since bombarded themselves with an overloaded desktop, with files and apps accumulating into one big hullabaloo. 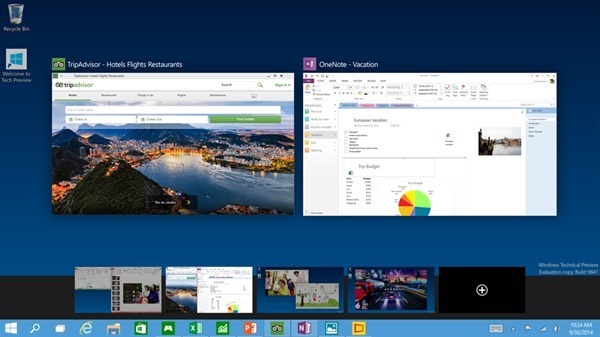 With Windows 10, users will be able to create multiple / virtual desktops, allowing productive, organized folk to arrange separate desktops for different tasks, while those messy folk can make a real mess over several plains rather than just the one. The next version of Windows is tailor-made to work on all devices, be it a 4-inch phone, all the way up to a mighty 80-inch display. 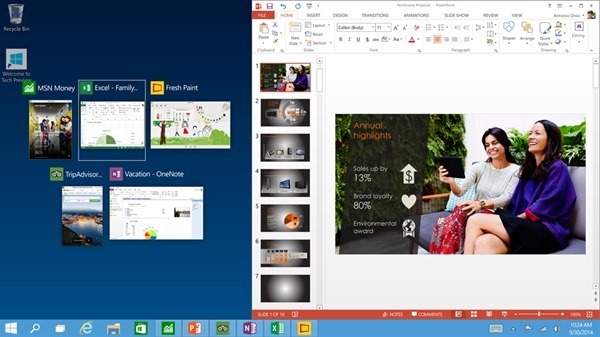 The Technical Preview of Windows 10, which has been referenced ad nauseam over the last couple of months, will be available for users to test starting October 1st, 2014. The all-new Windows Insider Program will, a bit like Apple’s new OS X Beta Seed program, allow regular users to test drive unfinished software should they so wish, although as exciting as it sounds, interested parties should remember that the experience is likely to be buggier and more erratic than usual. Microsoft revealed that Windows 10 will roll out in the middle of next year, and although naturally vague at this stage, did also add that it would be releasing after the annual BUILD dev gathering. There’s no word on the price as yet, which makes sense given that we’re barely over the line for the announcement, but as soon as this information is made public, we’ll have the details right here. Do be sure to share your comments with us below! RIP Windows 9. Didn’t even have a chance. 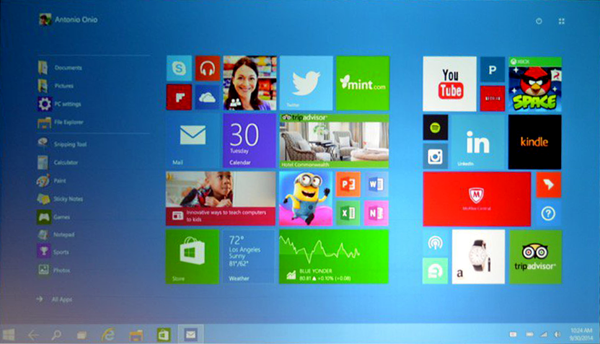 I’m interested in this as I agree Windows 8 was too much of a leap. Will definitely consider upgrading once RTM is out. I don’t have a spare computer to be fiddling with betas as I did back with Windows 7. You could always try VitrualBox and create a virtual pc. It’s quite easy and doesn’t require a second computer to test stuff. Thank you. I will definitely consider. 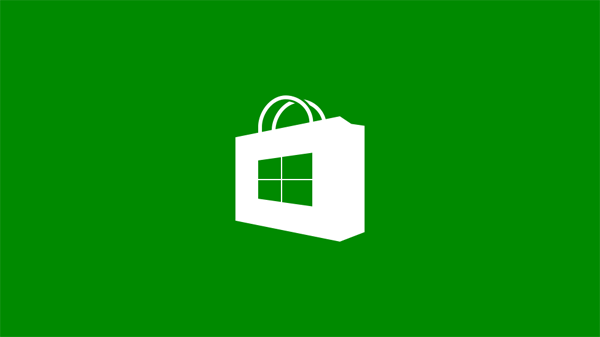 It looks like microsoft have inspiration from apple’s MAC OS X.. Own store, something like launchpad (metro).. I don’t like microsoft.. It is very expensive, for product, that have 100000 errors, and problems.. Can be hacked, destructed, slowest.. So Mac OS forever.. 😉 But for games, it is better, but PC isn’t to playing games, there is ps3/4 (maybe xbox) for that.. So PC with windows isn’t good for everything as well as other platforms.. 🙂 Work, Music making/listening, Movie making, adobe programs and other (mac os), playing games (ps3/4). Microsoft has inspiration from linux, as well as MAC OS X copied many things from there. I manage an Apple authorized service provider. If you think mac’s can’t be hacked by the likes of malware then you are grossly misinformed. I love the Mac OS but people need to get these preconceived notions out of their minds. Apple can write cleaner code because they only have to support the hardware they want to support. If anything else doesn’t work then it’s on that manufacturer. 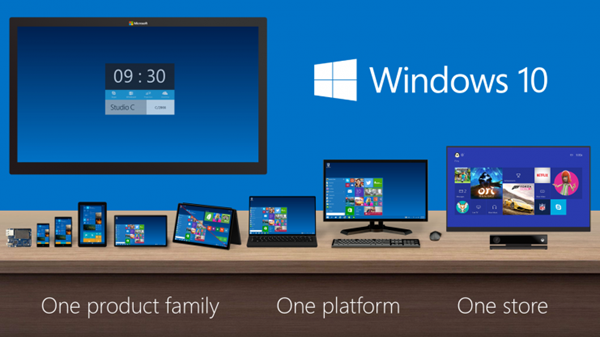 Windows has to support 1000’s of different combinations of hardware and can’t be optimized for a hand selected few. It’s amazing Windows works as good as it does. You have no idea what you’re talking about. Do you? In other words, Microsoft Windows is “finally” catching to the modern desktop features of Linux and OS X, which “both” have had these capabilities since the Windows XP era. linux have no apps store.. 😉 So this one is from mac e.g. Ubuntu has one and had for a long time(Initial release: October 29, 2009; 5 years ago). While Apple did it only in 2011..
As far as I’m concerned having a Home, Home Premium, Pro, Enterprise and Ultimate Editions is just a cash grab. All the rest is just drivers and OEM configuration, so 1000’s is subjective since all modern day OS’s are modular and have the API’s to program drivers. Apple is keeping their hardware to themselves and not licensing it. I don’t see this as as big a deal as Apbreck does. I’ve been working with SCCM for years, so I package and deploy apps, and manage PC’s, and there are lots of ways Windows could do a better job. eg. better interface uniformity across screens in Windows and MS apps is my biggest gripe, better simplicity, cleaner options, less typical bugs everywhere, force removal of the start button and backwards compatibility in Win8 – lame. I’m glad MS tightened up their driver submissions, so there are less BSOD’s, but networking is still a issue. Hybernation has the same issues from XP. Memory management is better, but it still could be less bloated. I could go on and on. The Mac OSX has really become a tighter OS through each revision. The biggest problem is IT management, but they really have become superior in many areas. Big/Different/etc. is post-process for product, once idea is implemented/copied. My point is that whatever you see in MAC OS is not original, it’s been awhile ago somewhere else. Apple adopts products to the mass-marker, but there is nothing new in there. Wow, i’ve never heard such a bunch of horseshit from someone who clearly doesn’t know what he’s talking about. 10000 errors, what year do you live in? Windows isn’t a platform as you’re calling it, it’s an OS, PC is a platform and it does all that you’ve listed for far less money i’d spend on an overpriced iMac. But most importantly man, your make up your lack of info by liking your own comment, and you know what they say: liking your own comment is like sucking your own d*ck. ok bro 😀 I like myself, I don’t care if you not yourself, but it is error in your brain 😉 Go to hospital, with your head. windows is expensive???????????? thats pretty big words from someone who is probably typing that comment on his 2000$ worth of useless macintosh,that does half of what a pc does and charges double. Double with useless speed yeah? .. Sorry I don’t want to play games on my PC/Laptop.. I need to work on them.. For the games there’re consoles, you can use, not computer..